We’ve always believed that a balanced workplace results in a stronger work environment, a more diverse culture, and ultimately better business results. Since founding Taylor Hopkinson in 2009, we’ve worked to include women on every shortlist we present to clients and we’re seeing more and more of those female candidates being placed based on merit, not just fulfilling quotas. We’ve noticed a huge shift internally too. Since receiving the backing of our financial investors, team Taylor Hopkinson has almost doubled over the past year and 11 of our 16 new hires are women. This puts our own gender balance just above parity. These roles are spread across all departments and levels in the company including sales, senior management, operations, and finance, not the stereotypical departmentalisation of the Madmen era. The World Economic Forum tracks the Global Gender Gap Index based on 4 key areas: health, education, economics and politics. In November 2017, the WEF Gender Gap Report highlighted that globally, progress on closing the gender gap had stagnated at 32%. Projecting this rate of progress into the future, the WEF calculated that it would take another 217 years to reach gender parity! International Women’s Day on March 8th, 2018, is rallying around the theme of #PressForProgress to help close the gender gap in decades or years, instead of centuries. And it’s certainly possible. Leading the index since the report began, Iceland has closed their gender gap by 88%, an increase of 10 percentage points in a decade. The country is taking on the economic component of the gap with a direct approach by implementing legislation on Jan 1st 2018, making it illegal to pay men more than women. The aim is to eliminate the pay gap completely by 2020. 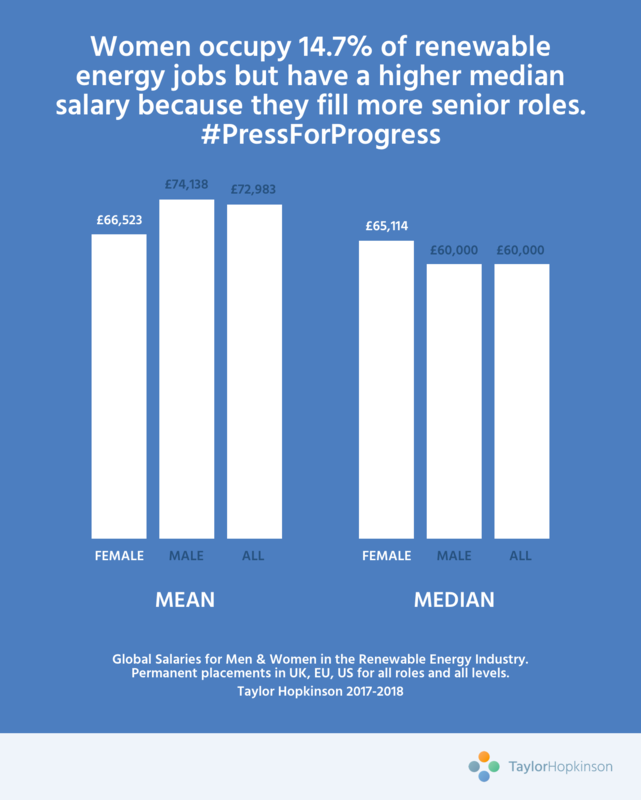 To understand the gender gap in the renewables industry, we studied our own data. Sidenote – we didn’t compare female and male salaries broken down by like-for-like role (we’re with Iceland on that one). Rather we looked at a snapshot of overall salaries across all sectors, territories and levels of seniority. It’s a quick way to take the pulse of the industry rather than a comprehensive study. When we looked at aggregate salaries for all permanent placements in the EU, UK and US over the past year, we found that 14.7% of hires were female. Globally, we found that the mean salaries for females we’ve placed was £66,523 compared to £74,138 for males (salaries normalised to £GBP based on exchange rates on 7th March 2018). But to eliminate the Bill Gates Effect we looked at median salaries. We found that the median salary for women exceeded that of men (£65,114 vs £60,000). The median results suggest that, relative to men, the women who are being placed are entering more senior and executive roles. This is especially true of the UK where the average female salary of £68,284 exceeded that of men by 10%. So although largely under-represented in the energy industry (just look at the list of speakers and delegates for a conference), women’s voices are being heard in the boardroom. We also know that having a board that includes women doesn’t automagically grow profits but it does correlate positively with company success, environmental consciousness, and innovation. There’s still a long way to go until we have workplace parity where women are represented fully at all levels throughout the industry. Renewable energy companies are defined by their progressive culture and ability to execute. It’s encouraging that this ambition also encompasses gender equality. We’re excited to help make this happen. We’re eager to see more women coming up through graduate level and entering the industry. But it’s still relatively early days in the UK’s STEM-focused industrial strategy to educate and develop the next generation of Scientists, Technologists, Engineers and Mathematicians. Let’s close the gender gap in decades or years, instead of centuries.